You can snap up a free copy of the goofy and charming side-scrolling RTS Cortex Command today on Steam as developer Data Realms celebrates the release of their follow-up game Planetoid Pioneers, which is launching February 8. Enjoy playing your way? Here’s our list of the best sandbox games available on PC. Originally released in 2012, Cortex Command brings together ideas from Worms, Terraria, and newer titles like Steamworld Dig. 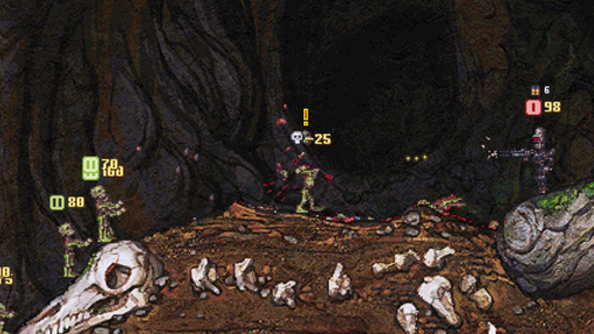 You’ll fight off hordes of enemy robots, trying to take out the brain controlling them while protecting your own. It’s a charming and deceptively deep game that’s well worth the download. Planetoid Pioneers looks as though it’s bringing a lot of the same QWOP-style action from Cortex Command into what they’re calling a “physics-driven Metroidvania-like,” complete with puzzle solving, crafting, and destroying things for maximum comedic effect. It’ll also feature co-op with up to three fellow players. The free offer is only valid through tonight, so head on over to the Cortex Command Steam page and click “Install Game” to permanently add it to your library.